Be the best Widowmaker that you can be. If you are new to Widowmaker, then welcome to the world of this awesome Hero. Start here at the top and work your way down through the guide. If you are a more experienced player then jump down to the Tips and Tricks section for the more advanced play. Widowmaker is Overwatch’s token sniper and is focused entirely on providing vision to her team alongside high single-target damage. In comparison to other Heroes, she brings almost no utility - her sole purpose is to kill quickly from afar or pressure enemy Heroes with shots so they’re forced to find cover. While this might seemingly make Widowmaker a shallow Hero, her depth comes from not only perfecting your shots but positioning yourself so you’re always able to attack the enemy. What’s often evident with Widowmaker is that the gulf between a good one and a bad one is enormous. Where a bad one will severely hinder your team (effectively leaving every fight as a 5 vs 6) a good one will be able to not only secure kills constantly, but pressure enough to allow the rest of her team to finish them off. Unfortunately the bad Widowmakers tend to outnumber those good ones by a wide margin. If you’re poor at aiming, it might be best finding a Hero that’s far easier to succeed with. You can also practice her in quick match, just please don't practice in ranked. Her mission complete, Amélie returned to Talon, and they completed the process of turning her into a living weapon. She was given extensive training in the covert arts, and then her physiology was altered, drastically slowing her heart, which turned her skin cold and blue and numbed her ability to experience human emotion. Amélie was gone, replaced by "Widowmaker," Talon's most effective assassin, and feeling little save the satisfaction of a job well done. Widow’s Kiss: Assault - When Widowmaker isn’t using her scope, her rifle can be used as a fully-automatic submachine gun. It’s primary use is for close quarter skirmishes when being scoped in is simply too risky. Although its damage isn’t amazing (13 per round) it fires incredibly quickly and with a magazine capable of carrying 30 bullets, it’s often more than enough to finish off low health Heroes or pressure someone who thinks you’re an easy kill. Tip - Aiming for a player's head with her submachine gun allows you to deal much more damage. Widow’s Kiss: Sniper - Using the right mouse button allows Widowmaker to zoom in on a target, using her scope. Having the ability to snipe enemies is key to Widowmaker’s playstyle and you should spend the majority of your time doing it. By default if you were to simply press the right mouse button and fire at an enemy it would deal very little damage (as low as 17). However, if you wait while scoped you will charge your rifle, allowing it to deal significantly increased damage (as much as 120, although headshots can deal 300). As a minimum you should always wait until your rifle has at least 60-70% charge. It’s also important to remember what health enemy Heroes have, as a fully charged scoped headshot against most heroes will kill them. It is always best to aim for the head unless the enemy is very low due to an ally or missed headshot. Grappling Hook - Providing Widowmaker with all her mobility, her Grappling Hook allows her to pull herself to any solid surface once it’s gripped on. It’s important to note that once you’ve fired your Grappling Hook, you’ll retain some of the forward momentum as you’re pulled forwards. This allows her to leap upwards as she arrives at her point of impact, giving her the opportunity to not only position herself in the air, allowing for shots. Be sure to use her Grappling Hook to reach vertical locations or to escape enemy players who get too close (fire at a distant wall). Tip - If you fail to make contact with a surface when firing your Grappling Hook its cooldown will be reset. Venom Mine - When activated Widowmaker will fire a sticky mine that attaches to any surface. Once it has armed, any enemies who walk near it will cause it to explode. Poisoning anyone in its explosion radius, the Venom Mine will deal damage over time. Dealing 75 damage over several seconds, it isn’t a huge amount but it can often be enough to wound a player who is trying to reach you, or reducing their health enough that you can finish them off with your submachine gun. If you can, you should always place your Venom Mine to protect your flanks so that enemies trying to reach you are struck by it. Just be aware that your Venom Mine can be destroyed by others. Infra-Sight (Ultimate) - Providing Widowmaker and her entire team with vision of the enemy - represented by a red heat signature. This allows easy headshots when enemies turn corners. 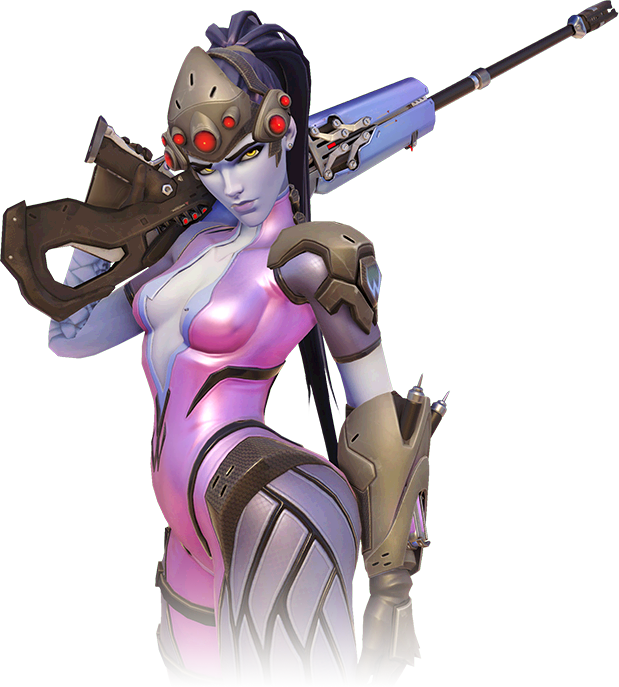 When it comes to strategy, Widowmaker is pretty archetypical of a sniper. She excels on maps that have large open spaces, or long corridors so that she can comfortably snipe the opposition from afar. Unsurprisingly any maps that require close quarters she fares poorly on, especially if there are lots of flanks as she’ll be unable to cover all angles or get good sightlines. Maps such as Nepal are particularly poor for Widowmaker. If you do have sightlines however, she can be devastating in the right hands but requires exceptional aim and positioning. The main thing you have to be careful of is the fact that if you do find a good sniping location and secure several kills, the enemy team will ensure they make their way towards you upon respawning. Constantly moving by using your Grappling Hook allows you to confuse the enemy, find a new location and continue to attack without risk. Tip - Try not to stand in an open space when using your scope. It’ll leave you vulnerable and you’ll be an easy kill. Find cover. I will add that as a sniper, securing head-shots will almost always guarantee a kill at full charge of your rifle. However, if you can secure one from a body shot there’s no need to pressure yourself by trying to aim for the head. Many Heroes have 200 health or less and if they’ve already suffered some damage, it’s more than possible to simply finish them off with a single shot to the body. It’s also far easier to accomplish. Heroes listed here are particularly challenging for Widowmaker. While those listed can still be killed, they pose a particularly difficult challenge for her so be sure to take extra care. Reaper: Reaper is a threat because of his ability to teleport to a location of his choosing. If you think you're safe on a roof-top, you aren't. Always be wary of him appearing next to you. Pharah: Her ranged poke and aerial mobility will always cause you problems, regardless of where you use your Grappling Hook. If you're in open view, she'll easily gun you down. This list of tips and tricks are just a handful of things we think will help your Widowmaker play. We'll continue to add to the list as required and if you have any tips you'd like to share, let us know in the comments below and we'll place them here. Playing Widowmaker on King's Row - Video with commentary. A high ranked Widowmaker shows you how it is done. Part 2 of Kephrii's series of high-ranked play. 1. Remember that you're a sniper - range is key. Always find high buildings or walkways to fire from. 2. Secure your location with a Venom Mine to prevent enemy players from flanking you. At the very least it'll give you a warning sign someone is coming. 3. Your submachine gun is a last resort. It doesn't deal huge damage but with the poison from your mine, you can really hurt someone. 4. Your Grappling Hook will propel you forwards and upwards, providing you with a mini-leap upon impact. Use this to get on ledges or adjust your position mid-air. 5. Fully charged sniper shots deal 150 damage, more than enough to instantly kill Heroes such as Zenyatta. Don't feel pressure to shoot at someones head. 6. Your Ultimate ability provides vision for your entire team. It's invaluable for predicting where enemies will come from and allows you to ready yourself to snip incoming foes. Don't waste it. 7. Infra-Sight is perfect for lining up head-shots on unsuspecting players. Watch their movement and simply aim for where they'll be when they turn the corner into your view. 8. Venom Mine can be thrown a reasonable distance. It's more than possible to flank the enemy and throw this into a group of them for high AOE pressure. 9. Try to always change locations. A Widowmaker who stays in one spot is easily countered. 10. If an enemy gets too close, quickly use your Grappling Hook on any object in the distance. You'll be pulled away and upon landing, drop your Venom Mine to prevent pursuit. 11. When in melee, throw your Venom Mine at your feet to gain a 75HP damage advantage on your opponent.